Home appliances are often blamed for starting fires, and now a Hotpoint refrigerator made by Whirlpool Corp. is being identified as the source of a deadly fire that killed at least 79 people in a London high-rise. Police identified the refrigerator as a Hotpoint FF175BP. Officials said the device is being examined by technical experts to “establish whether any further action is required,” such as a recall. “At this stage there is no specific reason for consumers to switch off their fridge freezer pending further investigation,” the Department for Business said. The fire gutted Grenfell Tower, in London's most affluent district of Kensington, in the west of the city. In a statement, Whirlpool said it was treating the investigation "as a matter of utmost urgency and assisting the authorities in any way we can.” It has issued what is called a "product notice" in Great Britain, sort of a preliminary recall notice. 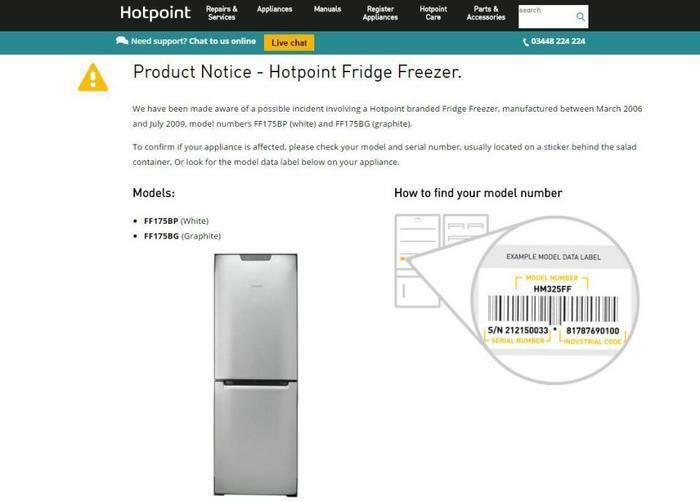 It is asking for customers who have one of the refrigerator-freezers to register their details for further information while an investigation takes place. The company said that 64,000 of the fridges were manufactured by Indesit between 2006 and 2009, when the model was discontinued, several years before Whirlpool acquired the company. In 2009, Maytag -- now a part of Whirlpool -- recalled 1.6 million fire-prone refrigerators in the United States. The company said that an electrical failure in the relay, the component that turns on the refrigerator's compressor, can cause overheating and pose a serious fire hazard. At the time, Maytag said it had received 41 reports of refrigerator relay ignition, including 16 reports of property damage ranging from smoke damage to extensive kitchen damage. That recall included certain Maytag, Jenn-Air, Amana, Admiral, Magic Chef, Performa by Maytag and Crosley brand side-by-side and top freezer refrigerators. The recall followed complaints by consumers like Christopher of Castaic, Calif. "I was awakened this evening to the smell of electrical smoke. I traced it to the motor of my fridge," he told ConsumerAffairs.com. Kim of Sandy, Utah, had a similar experience. "Our Maytag side by side refrigerator model no. MSD2756AE started to smoke out of the control panel in the door for the ice and water dispenser. I took the control panel so I could unplug it to stop the smoking," Kim said in a December 2008 complaint. "The solenoid was so hot it melted all the surrounding plastic to a point it was dripping. We were very lucky to be home when this started so it did not start a fire or cause more damage." "I contacted our local Maytag repair shop and the technicain said there were no recalls and this sort of thing happens all the time with refrigerators," Kim said. Some Whirlpool owners said in 2009 that they experienced similar problems although there was no recall of their model. "Compressor relay almost caught fire. Wires were charred, they smell. I noticed recall for Maytag products for the same issue, but not the Whirlpool brand. It's the same problem as Maytag," said Robert of Auburn, Alabama, in a ConsumerAffairs review.